We’ve all done it (well, at least if you are a parent you have). You finally walk into Sunday Morning Service and fall exhausted into your chair – after a hurried morning and lots of guilt, you are in no place to worship. I would often drop my children off with a plea to behave, but after being rushed and prodded all morning they struggled not to cry. That was almost three years ago and I just had two little ones to get ready in the morning, with the upcoming arrival of our third baby, (then fourth and now fifth). I knew something had to give. Slowly we started to implement the following system to prepare for Sunday Mornings. My goal wasn’t merely timeliness, but holiness. 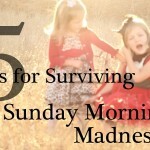 More than anything, I wanted my children to have fond memories of Sunday Mornings and not view Mommy as a fanatical hypocrite. I don’t suggest implementing all these ideas at once, but gradually try a few and see if they help! Also, IF YOU HAVE ANY IDEAS OR TIPS from your own experience, PLEASE LEAVE THEM IN THE COMMENTS BELOW! 1) Let it GO! Resolve to glorify God – even if you are late! With four young children and the fifth on the way, things happen! 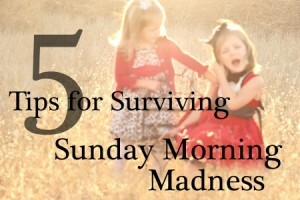 I typically wake up about 2 hours before we leave for Church, but there are times when I can’t control the busy morning of others or an explosive diaper happens just as we are leaving. Instead of focusing on, “what will everyone think when they see me arrive late,” I am comforted knowing that God is in complete control of even these moments and HE deserves to worshiped and receive glory! How many thoughts of resentment would have been avoided in the earliest years if we had just clarified who would do what in the morning! It really doesn’t matter who does what, but by having a plan everything will be done. I suggest making a list of everything that needs to be done and then deciding who will be responsible for each item on the list. You and your spouse may split the list, or you may decide that since your husband only gets to sleep in one day a week, you will do the majority of preparation. Either way, this should help to relieve some of the morning stress. 3) KINDNESS goes a LONG way! In the heat of the moment, when you are running late and your teenager has barely started to brush his teeth, you may be tempted to lose your temper. Remember to “Let it Go” and pray for wisdom, then address the issue later that week. The truth is that a chronically late child or family MAY be a sign of a deeper sin issue that can be addressed throughout the week in a more productive manner. For example, your child may be dealing with laziness, lack of diligence, defiance, or disobedience – or it may be a lack of training on your part. Speak lovingly and kindly and don’t escalate the tension by rambling on about how your child (or your husband) is always making you late! Instead, exercise self-control and kindness. You’ve heard this a million times! Here are my tips for the night before. Make sure your children are in bed at a decent hour so that they can be well rested in the morning. Have breakfast planned and possibly ready. No gourmet meals needed! Sometimes I’ll make extra pancakes the day before or put cereal on a necklace with a cup of milk if it’s an especially early morning. Bathe the little ones the night before. Have ALL clothing laid out the night before including socks, shoes, hair bows, and belts. I wake up about 2 hours before we have to leave and get myself completely ready before I wake up my children. This definitely helps me to be less stressed and better able to serve my family in the morning! Mirroring – I look too much like my kids!